A Chain of Title Report is an important tool for identifying and documenting past owners of a subject property, and a key element for completing a Phase I Environmental Site Assessment. 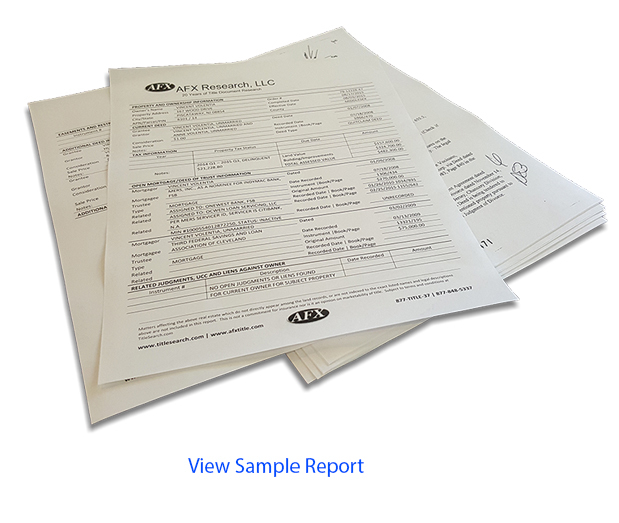 AFX’s Chain of Title reports have been used on thousands of sites nationwide. This research will be conducted using official land records corresponding to the subject property. Most commonly, these documents will be recorded with the respective County, but may be recorded on either the State or City level. The research is completed by reviewing the Grantor and Grantee indexes available in the local document repositories. AFX offers Chain of Title Reports going back 50 years, 60 years, and most commonly: back to 1940, in order to meet the ASTM guidelines.